The Nile, the world's longest river at 4,258 miles (6,853 kilometers), has long been the lifeblood of Egypt, and a cruise along this famous waterway ranks as a highlight of a trip to the desert country. Here are some options for exploring the waters of the Nile River. You haven’t seen Cairo until you’ve seen it from the Nile, and a river cruise affords the perfect opportunity. One of the most popular—and traditional—ways to explore these iconic waters is aboard a traditional wooden Egyptian sailboat, known as a felucca. An evening sunset sail displays Cairo in a warm evening glow, as you bob in the water, cold drink in hand. See the Cairo skyline from the water—its skyscrapers, bridges, and waterfront promenades—and catch a glimpse of day-to-day life on the banks of this famous river, as traditional fishing boats and feluccas go about their business. If you’re looking for a special night out, Cairo-style, book a Nile River dinner cruise. Options include an open buffet, set menu, or à la carte menu dinner, and some even feature belly dancing or tanoura (a folk dance similar to the whirling dervish) while you overlook the sparkling city lights of the Egyptian capital. See the Cairo skyline after dark on a 2-hour Nile River dinner cruise, and watch belly dancers and Tanoura performers take the stage as you enjoy a full buffet dinner. This evening tour includes pickup and drop-off at Cairo hotels, and combines dining, dancing, and music for a classic night on the Nile. Celebrate an evening in Cairo with a glittering 2-hour dinner cruise along the River Nile, with round-trip private hotel transfers. Travel to the riverside by private, air-conditioned minivan, and step aboard an elegant cruise boat, festooned in beautiful lights. Soak up the soft breezes and Cairo’s bright lights from the top deck as you glide by illuminated skyscrapers, bridges, mosques and other landmarks. Then, sit down to a delicious buffet dinner as you enjoy a colorful programme of folkloric entertainment, from sequinned belly dancing shows to whirling ‘tanoura’ shows. Celebrate an evening in Cairo with a glittering 2-hour dinner cruise along the iconic Nile River. Step aboard the elegant Nile Maxim cruise boat, and soak up the sparkling city lights, delicious food and live entertainment as you glide along the beautiful Nile. Feast on your choice of either a scrumptious set menu or à la carte menu; listen to tunes from the house band; and enjoy an after-dinner folklore show featuring sequinned belly dancers and spinning ‘tanoura’ artistes performing to foot-tapping folklore music. Explore the Nile River on this relaxing 3-hour, buffet dinner cruise. Like Cleopatra and Mark Anthony from yesteryear, sail the Nile, enjoy a delicious Egyptian buffet dinner and take in the evening’s entertainment with Egyptian song and dance — all with a spectacular view of the longest river in the world alongside Egypt’s bustling capital city. Complimentary mineral water, plus transportation, including a Cairo hotel pickup and drop-off, are included. Watch the Cairo skyline light up after dark on a 2-hour dinner cruise of the Nile with two remarkable dance performances. Enjoy the convenience of a private hotel transfer as you travel to the port, then enjoy a sumptuous Egyptian meal on deck. Watch belly dancers and Tannoura performers bring their traditions to life with a mesmerizing blend of twirling skirts and sensuous movements. Listen to live music from an Egyptian band and take in stunning views of the city at night while palm trees and glittering skyscrapers drift past. When you're in Cairo, take a classic Nile cruise with dinner and whirling dervish dancing. The experience starts with a hotel pickup from your Cairo or Giza hotel, and includes a buffet dinner of traditional Egyptian food. Tear your eyes away from the Nile to watch a folklore show with tanoura dancing, then travel back to your hotel when the river fun ends. Relax and enjoy the ambiance, views, and scenery on this one-hour Nile River outing. After pickup at your hotel, drive to the Cairo pier where you will board a traditional wooden sailboat called a felucca. Take in the sights and the evening sunset as you observe the bustling city life onshore. After the cruise, your driver takes you back to your Cairo or Giza hotel. Watch the palm trees and city lights drift by on a 2-hour dinner cruise of the Nile with a Tanoura performance and belly dance. Cast off from the pier in the warm, evening air, and enjoy a sumptuous open buffet as you navigate the river alongside feluccas and fishing boats. Enjoy views of the iconic city skyline, then relax to the sounds of traditional Egyptian music as belly dancers and Tanoura performers share their traditional arts with sensuous movements and bright, twirling skirts. There are few Cairo experiences more romantic than a dinner cruise aboard the Nile Maxim. Savor a 100% à la carte dinner—including delights such as shrimp—as you watch a belly dancer, a whirling dervish, and live bands from both hemispheres. To secure your place and door-to-door transfers from your hotel, book this convenient package ahead of time. Spend a relaxing evening aboard a Nile River dinner cruise and enjoy epic Cairo views, savory local cuisine and the company of fellow travelers with this popular tour option. It's the perfect way to see the city at night and the ideal end to a long day of sightseeing. Drift along the legendary River Nile on a traditional ‘felucca’ sailboat on a private 1-hour cruise in Cairo. After hotel pickup, travel to the portside and step aboard a delightful wooden felucca, complete with a billowing white sail. Settle onto the cushioned benches, sip on a welcome drink and admire Cairo’s skyline as you bob gently along the Nile’s waters. Waft by mosques, bridges and skyscrapers, capture photos of the passing sights, and watch as your felucca captain maneuvers the sail to catch the breeze. Cruise down the world-famous Nile River (and then cruise past a tasty buffet station) during this 2-hour evening boat ride including a show and dinner. Climb aboard your vessel for a cruise down this iconic waterway, enjoying nighttime views of local villages and river islands from the ship’s sun deck. Then head below for an open buffet plus a fun-filled show with belly dancing and ‘Tanoura’ (Egyptian folklore). 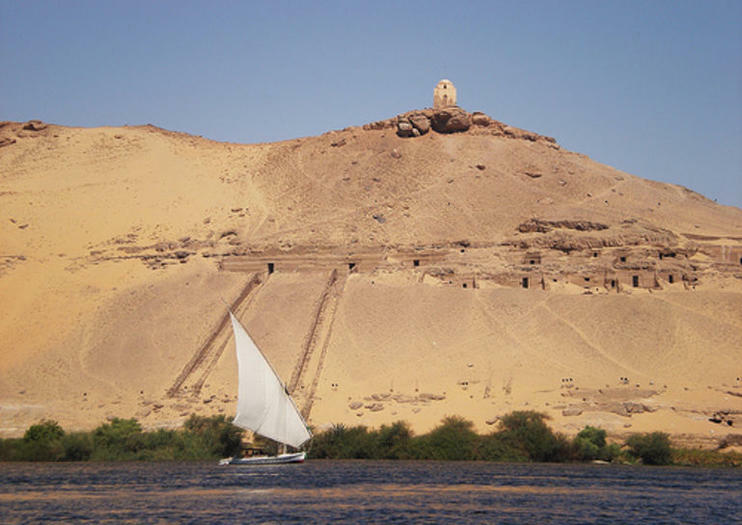 Your Nile River cruise also covers a guide, entrance fees and round-trip hotel transport from Cairo and Giza. Spend an enchanting evening in Cairo on a relaxing 3-hour dinner cruise along the River Nile. After hotel pickup, step aboard a comfortable cruise boat and watch the illuminated sights of the city glide by. Get great photos of the floodlit bridges, minarets and skyscrapers; soak up the magical atmosphere; and savor a scrumptious buffet dinner. As you eat, drink and relax, be entranced by traditional Egyptian entertainment in the form of belly-dancing displays, singers and whirling-dervish ‘sufi’ dancers. An ideal choice for couples and families. Cast off on the Nile for an unforgettable, 2-hour dinner cruise starting with a convenient, private transfer in an air-conditioned vehicle. Simply meet your driver at your hotel, then set sail in the warm, evening air. Relax over a sumptuous buffet dinner and listen to music from a live band. Watch palm trees and the city skyline drift by as belly dancers and Tannoura Dancers bring their traditional arts to the stage with whirling skirts and sensuous movements, then finish your evening with a return hotel transfer. Combine two cultural activities, a Cairo city tour and a felucca boat ride on the Nile, during this 6-hour tour. Walk through the city to see landmarks from the 2011 Egyptian Revolution and visit the Egyptian Museum of Antiquities, then stop for a traditional lunch of koshary before your boat ride.